A few days ago our family was returning to our dinghy after spending some time in the town of Luperon. The kids ran ahead. Soon, our family was strung out along the road like random beads. As we walked, we trailed behind a man pushing a wheelbarrow. The wheelbarrow contained a homemade air compressor, fashioned out of an old beer keg. The man pushing the wheelbarrow walked slowly. He was covered in dust and drenched in sweat. We continued to walk in the heat, behind the man. But, we arrived at the dinghy dock at the same time as he did. As I was about to pass him, he asked for help in English. My husband, Rick, helped him to carry the air compressor down to the dinghy dock. The man introduced himself as Salvador. His name came and went in my mind. But, his face must have burned a hole in my memory. I ran into Salvador again today. By chance, he appeared before me at the Luperon medical clinic. 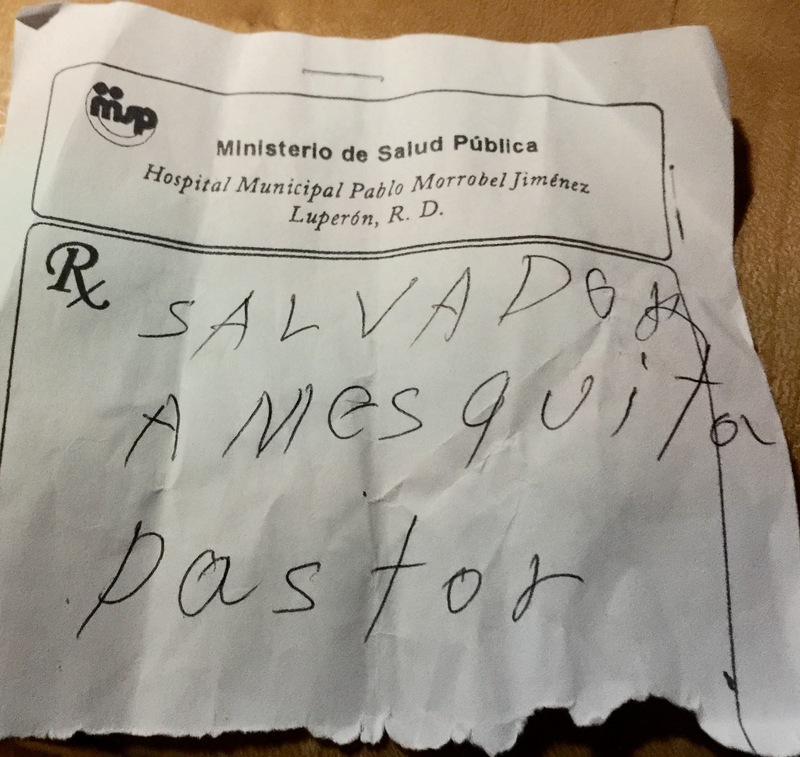 After struggling to communicate with my Spanish-speaking doctor, and armed with a Spanish-English dictionary, Salvador was summoned by the doctor to help translate. Because I have grown up in Canada – a culture that values patient confidentiality – the process of revealing my medical concerns to another patient was rather awkward (even if he wasn’t a complete stranger). The doctor asked Salvador to ask me about the nature of my problem. My situation was minor – especially compared to Salvador who was being treated for a barracuda bite. Yet, Salvador, another male patient, and at least two nurses were happy to help and discuss. They conferred in Spanish, and Salvador would ask me questions. Then, the rapid-fire Spanish would begin again as they asked each other questions, made suggestions and so on. In the end, the doctor suggested I go to Puerto Plata to see a specialist. Puerto Plata is an hour away by car. To my amazement, Salvador offered to drive me by car. He wrote his full name on a piece of paper. What’s in a name? As a cultural observation, full names are often expressed with pride and reverence here in Luperon, Dominican Republic. I was to meet Salvador at the dinghy dock at 6 a.m. He said that he would call the specialist to arrange to be seen. The specialist was an American – and definitely not free – who spoke English. When I returned to the boat, I contacted our travel doctor in Ottawa by email. He made some suggestions, and didn’t think it was necessary for me to go to Puerto Plata. He said that he was happy to help together with Salvador. As luck would have it, Salvador reappeared near the dinghy dock this afternoon. I told him that I no longer needed him to take me to Puerto Plata. He smiled and was happy to hear that I had found a solution to my medical concerns. Salvador Amesquita Pastor. I won’t quickly forget his name again. People can be amazing everywhere in the world!